Shinto: Jyo saku Wazamono cutting test ranking. Settsu. Habaki: gold wrapped double habaki. 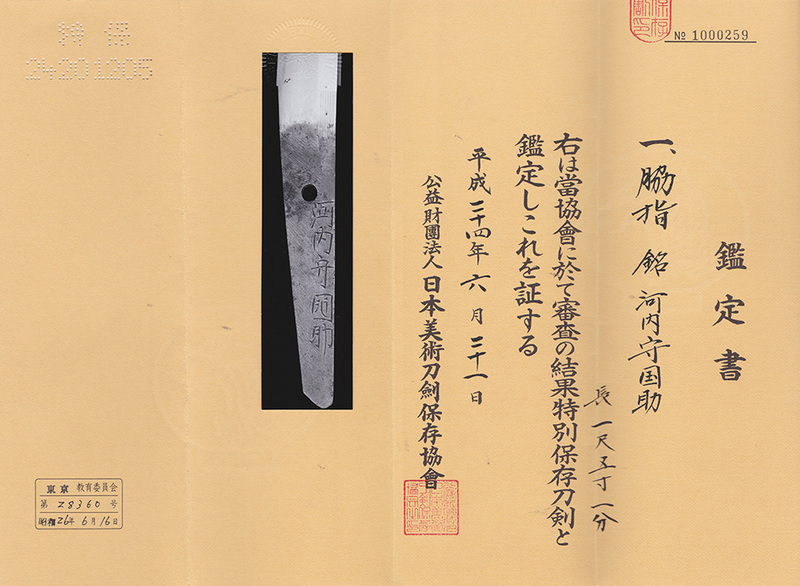 aki :Blade length : 45.6 cm or 17.95 inches. Sori :1.0 cm or 0.39 inches. Width at the hamachi : 2.665cm or 1.04 inches. Width at the Kissaki : 2.6cm or 1.02 inches. Era : Edo period Manji era. with jinie attach qite nice fantastic Jigane. cyoji midare work In Hamon, ashi and yo work. Boshi: notare and round shape. this wakizashi. From the brilliant hamon, he is also called Shinto-Ichimonji. and still has great appeal in modern times. Kunisuke's sword has a tendency curved slightly. The same thing can be said of Yasusada. with deep nioi-kuchi which looks like first generation Kunisuke. Saya :Marachite is used on the saya. Tsuba :On the round shape fantastic syakudo plate, tigers are engraved. Menuki : A fan is engraved in gold color. generation nice calm elegant jigane and hamon. Koshirae is also fine Saya and Tsuna. Japanese swords excelt Samurai and sword craftmen. So ,many sword makers obliged to abolish their making sword business.